Last year, my daughter waited around until the last minute to tell me she wanted to dress as a princess for Halloween. I bought her a discount pink princess costume that left her shivering by the end of Trick-or-Treat. So this year, when she came to me begging to be Elsa from the Disney movie “Frozen”, I could see the writing on the wall. The cold may not have bothered the ice queen, but my little one needed something warmer, and a store-bought costume wasn’t going to cut it. Fortunately, I sew. 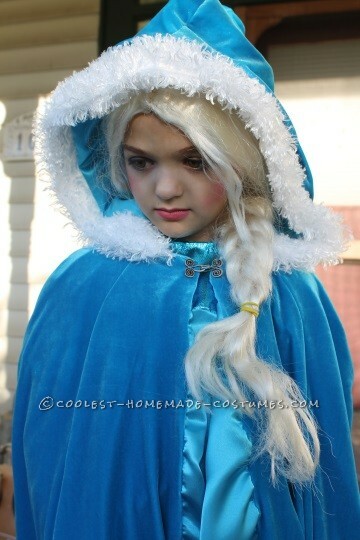 I pored over my extensive collection of patterns and found one that had an adorable hooded cape for warmth, and another, that with a little judicious use of fabric, would make a perfect Elsa costume, both warm and modest. With the patterns selected, and approved, I sent off for fabric swatches. 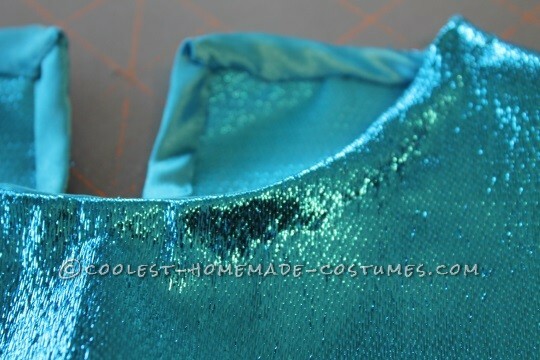 I settled on a turquoise lame for the bodice, a turquoise organza with sparkles, and turquoise satin for the skirt. The cape was a turquoise stretch velvet, lined with a turquoise satin and trimmed in some white fuzzy fabric I had leftover from a Santa costume I’d made for a friend’s son a few years ago. I took my time, knowing that, between the delicacy of the fabric and the frenzied activity of an excited child on Halloween, sturdy construction was a must. So, I carefully measured and cut out the pieces and stitched them together using French seams for both comfort and durability. 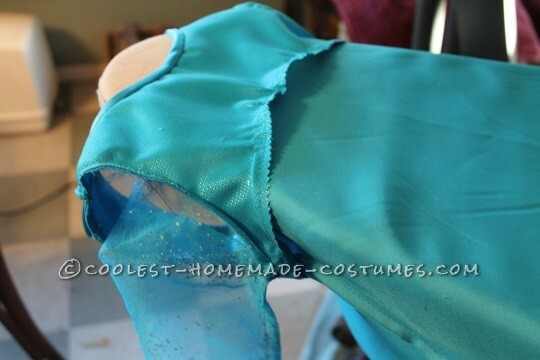 Once I had the basic dress sewn together, I turned my attention to Elsa’s iconic train. I purchased a long-sleeved leotard for her to wear underneath for added warmth because the temperatures were set to dip close to freezing on Halloween. But that wouldn’t be enough. In a frenzy of activity, in two days, I cut and sewed the satin and velvet and making a warm cape to go with the dress. Halloween night rolled around and we were off making our rounds. Our last stop was at the local “Trunk-or-Treat.” We showed up less than half an hour before the time it ended. My husband took our daughter around while I watched our boys, more interested on playing and running around than collecting candy. As we were all headed back to the car, my daughter came bounding up to me clutching a box in her hands. It turned out that the organizer of the event hadn’t awarded the costume prizes yet, and my daughter took first prize. Once home, she didn’t want to take off her costume OR the cape. And the cold never bothered her, anyway. 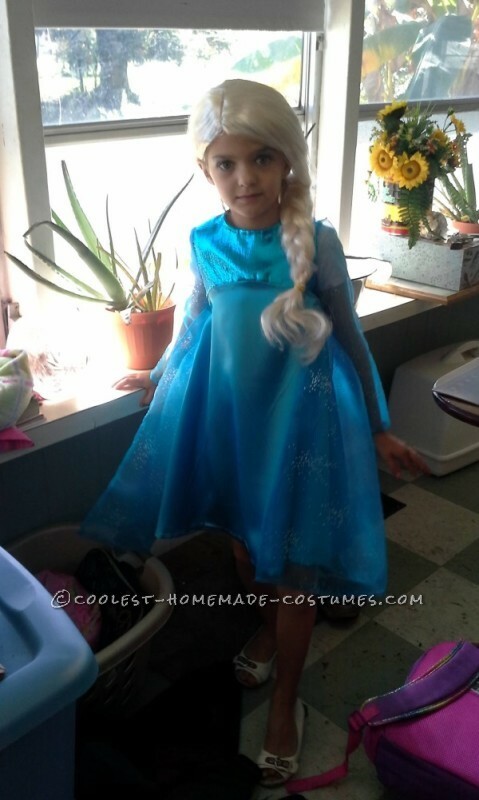 I studied the Elsa costume from the film. There was never any question about any part of the bodice being sheer, or strapless. I knew I wanted a dress with separate bodice, skirt, and long sleeves. Fortunately, I have a large stash of hundreds of patterns of all sizes and found Butterick 3316 that I had found at Goodwill. With an empire waist, long sleeves and flippy skirt, it was a perfect choice. The Internet is my friend. 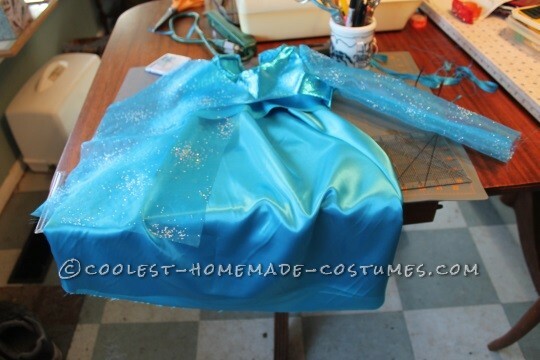 I spent days scouring online fabric stores for the perfect organza. 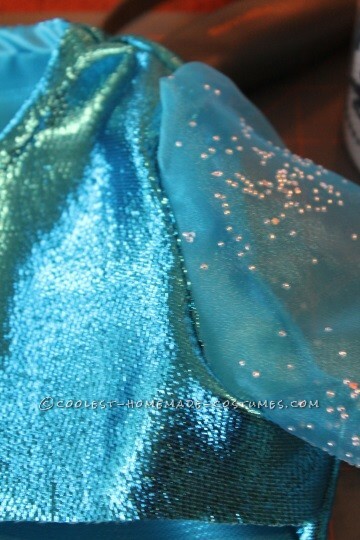 While Elsa’s movie dress had sleeves that were light in color, I opted for turquoise organza with sparkles. The movie dress bodice sparkled, which could have been accomplished with either sequins or lame. I toyed with the idea of using velvet, but my daughter insisted on the lame. I ordered fabric swatches and she approved my choices, once I showed her on the pattern envelope what I was going to do. The fabric order arrived on a long bolt the first week of October. Once I took the wrapper off and my daughter saw what was inside, she got very excited and insisted I begin work IMMEDIATELY! I measured my daughter to make sure the dress would fit her properly, and adjusted here and there where needed. 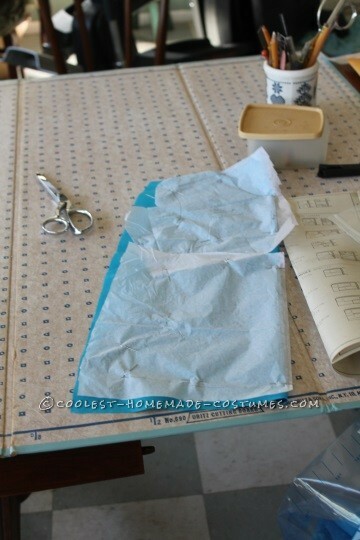 Taking my time, I traced the pattern pieces in her size onto some tissue paper as is my custom. This allows patterns to be used again and resized. The pattern was cut for a stretchier fabric with more give, so I cut the pieces generously, paying particular attention to the sleeves, sizing them as a nine in the forearm and tapering to a six where they attached to the bodice. Using extra satin, I cut bias tape for the neck and the placket because I knew the lame would irritate my daughter’s skin. Once I had the pieces cut, I strategized over the assembly. I read the pattern directions, but the instructions on how to attach the placket were confusing. Once I stopped following directions and used my common sense, it came together well, but it was touch and go for a few hours while I fretted over it. It was probably a good idea I put the directions back into the envelope when I did. 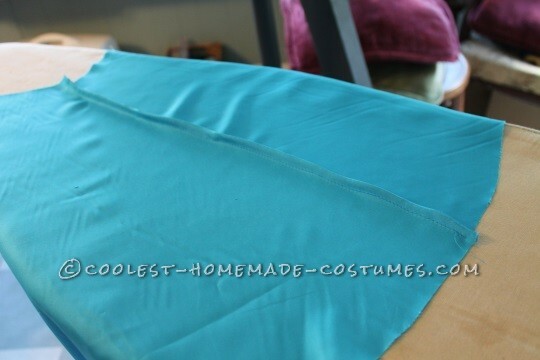 Due to the types of fabric and the need to make it sturdy as well as comfortable, I used French seams in the assembly, except for where the bodice and skirt attached. 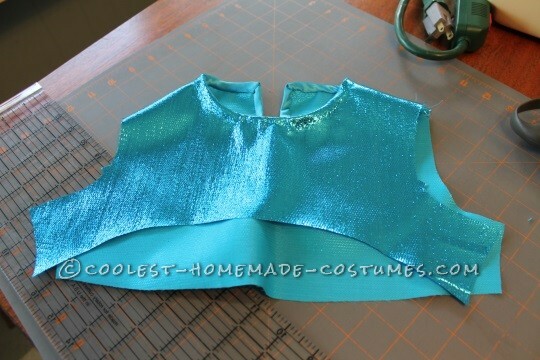 I pinned it several times because I kept pinning the back of the skirt to the front of the bodice. Once I had it all pinned properly, I quickly stitched it together, and hemmed it. An active child running from house to house trick-or-treating needs a costume that won’t get tangled up in their limbs. For this reason, I chose a knee-length dress. The most important part of the outfit to take it from a pretty dress to an Elsa costume was the iconic train. Fortunately, the movie character’s train attached just below her arms on the sides of her dress. This worked perfectly with a dress pattern with an empire waist. Taking the 60” wide, sparkly organza, I box pleated a length of it, trimmed the raw edges of the top in matching organza ribbon for added strength, hemmed the raw edges and sewed hook and eyes to the organza train and the waistline of the dress. Past experience taught me that a detachable train was easier to manage in the car. In two days, I cut out the cape and lining and sewed them together. Since the cape was velvet, lined in satin, I didn’t bother with French seams. I adapted the pattern for my needs, discarding the idea of a tie that it called for at the neck and substituting a metal fastener. I picked up some makeup more complementary to the Elsa coloring and dress, only to realize that I’d completely missed the mark. Looking at Elsa makeup tutorials online, and studying the movie character, I realized that I needed a pinkish purple eye-shadow. That little change made, I applied appropriate makeup from my stash and highlighted my daughter’s eyebrows. The costume was finished off with an inexpensive “pop star” wig that I bought at Walmart and braided to fall over her shoulder. 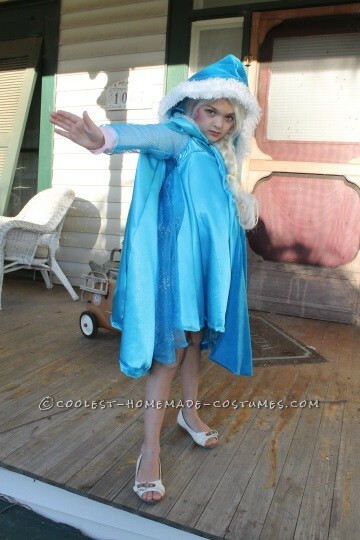 The Ice Queen attitude was all my daughter’s. Deceptively Simple Skull Makeup Makes Anything a Costume! She wants to wear the cape all the time too. That is a beautiful costume! Your daughter is very lucky to have such a talented mother. Have you ever considered making similar costume’s for profit? Thank you! I did have an Etsy store with children’s clothes and the like, but I closed it when writing started taking most of my time. I haven’t had much opportunity to sew in a very long time. Best homemade costume in my book! Thank you! I’m quite proud of the way it turned out.